Have you ever taken a moment to think about how your vehicle's tires are made? Probably not, yet doing so may help you better understand what goes into our tire repair service. More than just a few inches of thick rubber, your tires are actually made from layer after layer of fabric cords called plies. These plies sit atop steel belts that help to reinforce both the sidewall and the treads, which is formed from several layers of synthetic rubber. Steel cable loops called beads give the tire the strength needed to stay seated on the rim. Once those components are placed together, they are run through a curing machine which cuts the tread pattern and bonds all the components together. To learn more about tires, including tire repair cost, visit Meineke #2592 in St. Matthews, KY today. Keeping your tires in optimal condition is important for a myriad of reasons. First of all, well-maintained tires handle better on slick and uneven surfaces. Their ability to handle these surfaces means that you and your passengers are less likely to be involved in a collision. Tires also have a significant impact on your suspension system, and if they are not rotated periodically, you may have difficulty steering your vehicle. Tires are frequently overlooked by drivers, but the better your tires perform, the better your entire vehicle will perform. Stop by our St. Matthews, KY, Meineke #2592 store for a comprehensive inspection today. Proper inspections of your tires should happen at least once a month. If you often drive in rough terrain or other dangerous conditions, you should inspect your tires and wheels twice a month or more. This is because tires can become worn down or damaged very easily in certain conditions. Sharp rocks or other debris can weaken tires and lead to premature blowouts and necessitate the need for a repair or replacement. Bring your vehicle to Meineke #2592 in St. Matthews, KY for an inspection and tire repair cost estimate. This will help you avoid having to search for "flat tire repair near me." Tires are vital to the function and safety of your car or truck. The ridges and patterns that make up the tread of your tire are what help it grip the road and shed water to increase traction. When a tire's tread wears down, your vehicle no longer has the same traction and can become more unpredictable or more difficult to handle safely. Underinflated or overinflated tires often cause sidewall damage that can be dangerous, which can lead to sudden tire explosions on the road. Your tires should always be kept properly inflated. 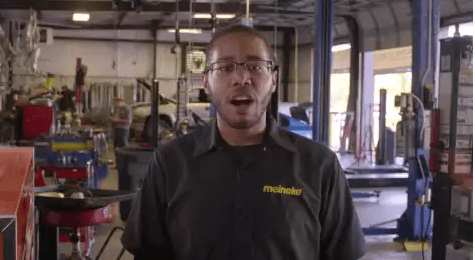 Learn about tire pressure sensor replacement when you stop by Meineke #2592 in St. Matthews, KY. The great thing about tires is that they usually show clear signs when they need to be replaced or serviced. Damaged side walls may be cracked and broken if the tire is old or failing. Tread on the tire may also seem noticeably low, further indicating the need for a tire repair service. In severe cases, your tires may be so damaged, you can feel or see the belts, or insides, of the tire. Wear on one side, or not enough wear along both sides of your tire also indicates a problem. If any of these happen to your vehicle, immediately contact Meineke #2592 in St. Matthews, KY to help you safely get back on the road. Because tires are your vehicle's only direct contact with the road, they should always be kept in the best possible condition. Tire rotation cost is a small price to pay to ensure that your vehicle is safe. Moreover, you can actually increase your fuel mileage by keeping your tires well repaired and maintained. Save money in the long run by taking your car or truck to Meineke #2592 in St. Matthews, KY for inspection, maintenance and repairs. We offer competitive pricing and tire rotation coupons to help you experience the best savings possible without compromising safety.